License Now - The "License Now" button will appear on song detail pages. The music rep has full control over which songs are available for online licensing and which are not. 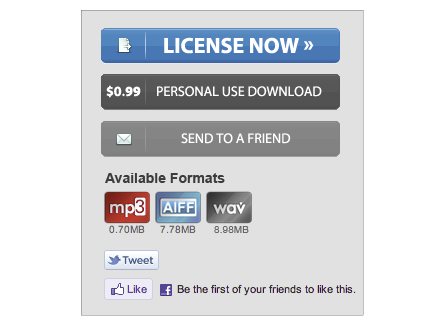 For those songs that aren't available, we'll simply hide the "License Now" button. We're also building a powerful administration tool that allows music reps to create and apply rate cards to one or more songs at a time - something we know we've nailed and are very excited to share. If a licensor is hesitant to pay the listed price for a license but doesn't want to give up on it, they can use the "Make an offer" tool we're integrating into online licensing. When you finish these great features up with our license & invoice PDF-generator, you've got our end-to-end online licensing product that's going to change the way many people conduct business in the space. We can't wait. $0.99 Downloads - We know editors, music supervisors, and media creators need to download mp3's to try them out in their project. We also know that most are accustomed to paying $0.99 at iTunes and other consumer music outlets to get their hands on the song they need. So, for those catalog owners/rights holders who would like to monetize the deep library of content they have on the SourceAudio platform, they can simply enable the new $0.99 download feature that will launch alongside online licensing. Every time a song gets downloaded the music rep gets paid. One last thing: our fees are going to be ridiculously low for all of this. Stay tuned for more information on that front as we get closer to launch!